From the lives of the desert-fathers, we see tangible evidence of the existing reality of the aerial realm. Armed with long hours of prayer and rigorous fasting, these saints manfully withstood the onslaughts of the demonic powers who often appeared to them in visible, hideous forms. As Christians slackened in their pursuit of the heavenly kingdom, the battle became less apparent; the material world only contributed to the weakness of Christian struggle; it saturated the soul with earthly impressions, weighing it down and obstructing its passage heavenward. Those rare individuals who developed the spiritual stamina of the ancient desert-dwellers, unleashed upon themselves the fury of the demonic powers no less cruel than that of centuries ago. This is evident from the life of Archbishop Theophan of Poltava, an outstanding hierarch and pillar of the Church in our own day, who was like unto the early desert-fathers in his resolute struggle against the prince of darkness. May this make us more conscious of the spiritual warfare which we too must wage if we wish to join the company of the saints. We wrestle not against flesh and blood, but against...the rulers of the darkness of this world (Eph. 6:12). 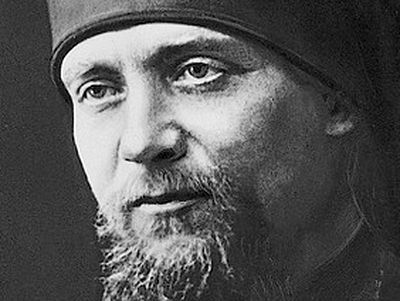 Born in 1873, the son of a village priest, Archbishop Theophan excelled in his studies at the St. Petersburg Theological Academy, where he remained to teach after graduating. Two years later he became a hieromonk, and in 1910 was raised to the rank of archimandrite and given the position of temporary inspector. Four years later he was appointed director of the Academy. Interiorly he was of a highly spiritual cast of soul and a great man of prayer, for which he became widely known preeminently in the capital society. Not only did he unfailingly fulfill his monastic rule, often spending entire nights in prayer; he also attended all of the divine services which took place in the nearby cathedral. If for some reason he was unable to do this, he would read the daily cycle of services standing at the analogion in the icon corner of his cell. This he did even while traveling, always carrying about with himself the necessary service books. At one time he became the spiritual advisor to the Imperial Family. Later, he would recall with emotion how he often celebrated the Liturgy at the Court church on weekdays and how the Empress herself and all four Grand duchesses sang on the cliros. So thoroughly was he steeped in the Patristic sources that when anyone came to him with a question, he tried to avoid saying anything of his own but always went straight to his bookshelves, to the writings of the Holy Fathers. There he invariably found a precise and fully satisfying answer. He was himself a walking encyclopedia of all the various branches of theology and in general, of whatever pertained to the inner spiritual life. His profound theological understanding was reflected in his sermons which spoke clearly of his close affinity with the Holy Fathers. The students loved and respected him greatly and it was a great loss when he was relieved of his post at the Academy to assume the duties of a ruling archpastor. Ever since I came into being, I observe in myself an unceasing battle of life and death in the realm of existence, both natural and spiritual. O, how heavy this battle has been at times in me; but may there be thanks to the Lord for it! It has deeply implanted in my heart the saving truth that I in myself am nothing, and that the Lord for me is everything! Vladika Theophan suffered many severe assaults by the demonic powers who tried to frighten the man of prayer into ceasing his labors. Several of his cell attendants were witnesses to these attacks. Yet another witness was Bishop Seraphim, at that time in charge of the Russian church communities in Bulgaria. Once, he and Vladika Theophan were traveling together in the same compartment of an overnight train. Bishop Seraphim suddenly woke up and saw an enormous black cat with flaring eyes in the middle of the compartment, he heard the loud voice of Vladika Theophan: "In the name of Jesus Christ the Son of the Living God, I adjure you: get away from me unclean spirit!" The cat hissed, sending a shower of sparks, and then vanished. 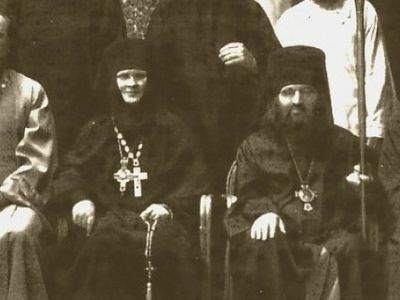 This so terrified Bishop Seraphim that he refused to ride again in the same compartment with Vladika Theophan. The Revolution overtook Vladika as Archbishop of Poltava, from whence he emigrated with the White Army through Constantinople to Bulgaria, where he lived for many years. During this time, some admirers rented for him a small house in the country outside Varna where he would spend time in the summer months. The house had two rooms and a kitchen. Vladika occupied the first room which had an entrance from the veranda; the second room was left empty, while the kitchen was used by Vladika's cell attendants when they spent the night. They discontinued this habit after being frightened by a series of nocturnal visitations. Suddenly, in the middle of the night, in the adjoining empty room, they would distinctly hear footsteps, then the sound of someone throwing whole handfuls of sand or earth through the windows, or other mysterious noises. At such times they would hear Vladika' s voice unusually loud: "In the name of our Lord Jesus Christ, Son of the Living God, I adjure you: be gone from me, unclean one!" Then everything would become quiet. Archbishop Theophan was uncompromising with regard to the teaching of the Holy Orthodox Church. He was deeply pained by the movements of the "renovationists" and "living church" adherents, which disrupted the Church in Russia in the years after the Revolution. Equally strong was his opposition to the teachings of liberal Church thinkers such as Soloviev and Bulgakov, popular among the Russian émigré intelligentsia. He saw that any attempt to modernize or to make concessions to the spirit of the times could only result in undermining the faith, in robbing the "salt" of its savor. Even the modernists, however, could not but respect such a spiritual giant of Orthodoxy. During the Russian Council of 1917-1918, some of them approached him respectfully: "The waves of the times flow swiftly, changing everything, changing us; one must give in to them. You, too, must give in, Vladika, to the raging waves ... Otherwise with whom will you be left? You will be left alone." "With whom will I be left?" Vladika meekly answered them. "I will be with St. Vladimir the enlightener of Russia, with Sts. Anthony and Theodosius the Wonderworkers of the Kiev Caves Monastery, with the holy Hierarchs and Wonderworkers of Moscow, with Sts. Sergius and Seraphim and with all the holy martyrs, God-pleasing monks and wonderworkers who have gloriously shone forth on Russian soil. But you, dear brothers, with whom will you be left if even with your great numbers you give over to the will of the waves of the times?" When I was informed of his death, an unexplainable torrent of bitterness seized me; I wept, knowing that a real saint had left this earth, leaving spiritual emptiness behind him and making this world gray and dull. At that time I had a terrible and unceasing toothache which gave me no peace. In agony, a flash of hope enlightened me: I turned mentally to Vladika as if he were alive right here and could hear me, and I prayed to him for help. Instantly the pain stopped ! Although I never doubted his sanctity, this miraculous intercession was to me a clear sign of his being indeed a saint of God! Once, in answer to the question "How can one be saved?" he answered, "The main thing is faith. Without faith, the very best of works are not unto salvation, for at the foundation of everything is faith. The second thing is repentance. The third is prayer, the fourth, good works. And despair is the worst of sins." 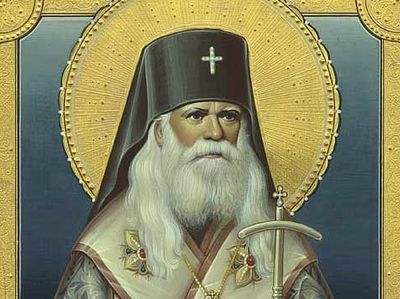 Vladyka advised, "As soon as you are conscious of having sinned, cleanse your soul with tears."